What is the COVAR Function? 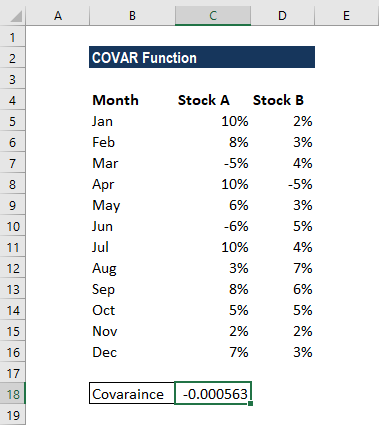 The COVAR Function is categorized under Statistical functionsFunctionsList of the most important Excel functions for financial analysts. This cheat sheet covers 100s of functions that are critical to know as an Excel analyst. It will calculate the covariance of two sets of values. As a financial analystFinancial Analyst Job DescriptionSee a real Financial Analyst Job Description including all the skills, experience, and education required to be the successful candidate for the job. Perform financial forecasting, reporting, and operational metrics tracking, analyze financial data, create financial models, suppose we want to see how two stocks may move together in the future. Looking at their historical prices, we can determine if the prices tend to move with each other or opposite each other. It allows us to predict the potential price movement of a two-stock portfolio. A high, positive covariance value between two stocks implies that when the price of one goes up, that of the other usually does, too. A high negative figure or value means that when one stock advances, the other generally retreats. If the figure is close to zero, with either a positive or negative sign, the two stocks act mostly independently. Array1 (required argument) – It is a range or array of integer values. Array2 (required argument) – It a range or array of integer values. If the given arrays contain text or logical values, they are ignored by the COVAR function. The data should contain numbers, names, arrays, or references that are numeric. If some cells do not contain numeric data, they are ignored. The data sets should be of the same size, with the same number of data points. The data sets should neither be empty nor should the standard deviation of their values equal zero. 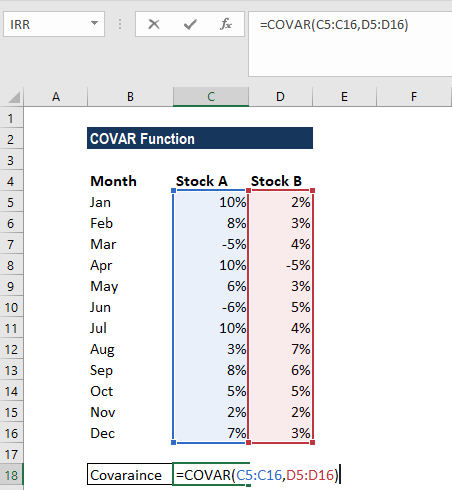 How to use the COVAR Function in Excel? We wish to find out covariance. The covariance of the values in columns B and C of the spreadsheet can be calculated using the COVAR function using the formula =COVAR(B2:B13, C2:C13). It gives the result -0.000563, which indicates a negative correlation between the two sets of stocks. The function was introduced in MS Excel 2000. #VALUE! error – Occurs when one or both of the supplied data arrays are empty. #N/A! error – Occurs if the given arrays are of different lengths. 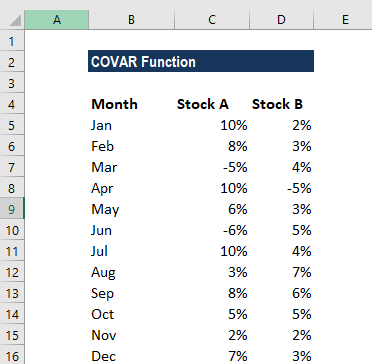 In MS Excel 2010, the COVAR function was replaced by the COVARIANCE.P function. However, COVAR is still available in MS Excel 2010 (stored in the list of compatibility functions) to allow compatibility with earlier versions of Excel.